I took the Fate Bell Pictograph Site tour and finished by hiking back along the Windmill Nature Trail. I will discuss these separately. The Fate Bell Pictograph Site tour is a ranger led tour that is given at 10am and 3pm. The cost is $5. You start the tour by hiking downhill from the Visitor's Center down into Seminole Canyon and then over to the Fate Bell rock shelter. There you can see numerous, impressive pictographs made from ancient native American settlers from the past. Many of the pictographs are visible, but sadly they are fading quickly over time. It is believed that when the nearby Amistad Reservoir was created in the 1960's, the increase in relative humidity in the air is causing the pictographs to fade away. In my opinion, this is $5 well spent. I would encourage you to see the pictographs while you can. The Windmill Nature Trail is a short, basic nature trail that loops along the canyon and ends near the windmill near the Visitor's Center. 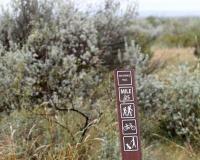 There are exhibit signs identifying various plants along the way, but the trail isn't very impressive in my opinion. The New Canyon Rim Trail Is Awesome! I hiked Seminole Canyon via the Rio Grande Trail back in 2008 and was impressed by it. The only drawback was that the trail was fairly boring until the very end and then, WOW! You were provided with some breathtaking views of the canyon and river running through it. 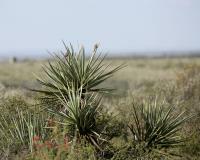 The Canyon Rim trail provides many more scenic overviews of different parts of Seminole Canyon and also takes you out along the banks of the Rio Grande River. The trail is well marked with huge rock cairns and is easy to follow. In my opinion, this new trail is the best thing this State park has done. It really shows off the natural beauty of the area. Good job, Texas State Parks! There's a new trail under construction at Seminole Canyon, it's listed on the map as "Proposed Hike/Bike Trail", and is now about 90% complete. I walked it this past weekend; you can access it about a half a mile down the Rio Grande Trail, the first chance you get to turn off to the left and just over the ridge that marks the 1882 rail grade you'll see a large cairn of rocks (about 4-5 feet high). From here, you follow the trail that hugs the top rim of the canyon until it meets back up with the Rio Grande Trail several miles just before the first picnic table overlooking Panther Cave. This part of the trail is not specifically marked, other than some rock cairns, but it is cleared of loose rock and very easy to follow. It follows along the edge of the canyon, so not much elevation change, and also much more interesting views than the Rio Grande Trail (which is mostly a featureless desert slog). From there, follow the Rio Grande Trail the last part of a mile to the end, where a new trail continues along the edge of the Rio Grande, then loops back to re-connect with the Rio Grande further up. This trail is only about half-finished, the last part only marked by scant red ribbons in the vegetation. This loop is about a mile long, then after reconnecting with the Rio Grande Trail, just follow it back to the starting point. This was my first hike in West Texas and it exceeded my expectations. This state park has about 6 miles of trails plus a short nature trail near the park HQ. The hike is a little plain, but the trails are wide and extremely well maintained. At the end of the hike, you are given a spectacular view of Panther Cave and the Rio Grande river as it pours into Seminole Canyon. You get cliff vistas several hundred of feet over beautiful green water. It is quite astounding and makes the hike worthwhile. You can also walk around off the trails to get a better view of the river. There is also a small guided tour trail that takes you to the Fate Bell Rockshelter Weds - Sun. Unfortunately, I was there on a Tuesday, so I was not able to take this guided tour, but I was able to get to a point where I could photograph the rockshelter. One other thing that makes this hike interesting is to find the fossilized imprints of sea creatures in the limestone that date back approximately 100 million years. It is like walking through an outdoor museum of natural history. I highly recommend hiking this park! This hike starts out boring and continues to be not very interesting until near the end them WOW WOW WOW. The last half mile makes it worth while. When you get to the handrailings, go around to the right and down a ledge or two and see the lake and Mexico in all its splender. On the return take all the little side trails to break up the monotonous trip back. Extremely easy walking, but miserably hot in summer. Very good for biking to cover the flat desert faster. Worth the hike to see the rock art, but don't go in the summer.